Digital Radio is becoming increasingly important in hi-fi - see the likes of products like the Arcam DT91. But now - thanks to Denon - Digital Radio and the mini system have suddenly become an item, with products like the D-F102DAB system. It comes in three cardboard boxes; one for the DRA-F102 DAB/FM/AM receiver, one for the DCD-F102 CD player and the largest housing the funky SC-F102 speakers. 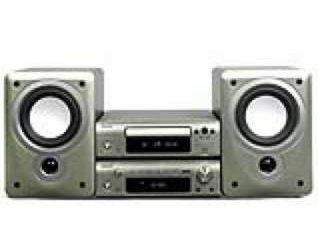 Those wanting to port an MP3 player can stick it into the front audio jack, or use an optional ASD-1R iPod dock, which offers remote control over the Apple player. For those after a touch of retro, a DRR-F102 cassette deck is available as an optional extra too. The specification is impressive for what is essentially a mini system. The receiver is a 35 watt/channel model, but this is a realistic RMS figure instead of a hyped up peak music power output rating. This unit also sports the tuner, proper phono connections and even an input for a turntable. The CD player can cope with MP3 or WMA files recorded on a CD-R, and sports a 192kHz, 24-bit audiophile-grade digital to analogue converter. Both modules have clear and easy to understand displays, with a two-line dot matrix scrolling text for DAB info (iPod too if you use the ASD-1R). Both units draw an environmentally-chummy 0.1W in standby. You can shave £100 off the price of the system by going without the two small speakers, but they are well matched to the rest of the system. These inverted tweeter designs (the bass driver is over the treble unit, not the other way round) are Euro-designed and include optional foam bungs for close to wall use. Denon calls this system 'serious hi-fi ... only smaller', and the D-F102 lives up to the claim. The sound is richly dynamic, clean and musical. Best of all, like a good hi-fi should, it sounds just as good wigging out to heads-down rock as it does being cerebral to some Bach two-part piano inventions. Of all the sources on offer, the CD is the real star; it puts many good separates CD players to shame with its honest portrayal of music in the CD tray. But the radio section is not far behind, and in many respects the sound of DAB through this system represents the best balance between pleasant sounding but frequency-limited portable radios and the digital-laid-bare sound of full-on separates hi-fi . Through this system, DAB needs little apology, and the crisp sound of the system perfectly matches the Digital Radio medium. In fact, it's only when you push the envelope do you uncover this system's limits. They are the 'only smaller' part. This system will not fill a big room with music or play well at ear-splitting levels or (paradoxically) at whisper-quiet levels. But that's missing the point: this Denon is the kick-off point for real hi-fi.